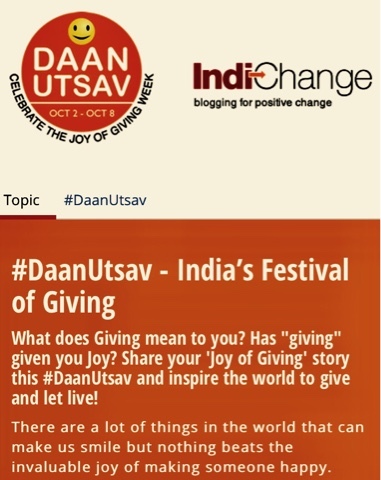 I came to know about this event of DaanUtsav, where compassionate people from all walks of life group together and donate whatever they feel. I remember reading a story of Nagar seth of Vaishali. When Lord Buddha had visited Vaishali, near present Patna, he was greeted by the wealthy businessman of the town. He pleaded to Lord Buddha that he wanted to give donations and asked if they wanted anything. Buddha didn’t say anything, but his disciples said if he could purchase and donate the “Amra Vana” (the mango grove) spanning vast area of land, they could meditate under the trees. Now this place belonged to another competitor of his business, but he still asked him the price of that place. Now the competitor said mockingly that he would not be able to pay the price of it. He asked him to name the price first. The utmost exorbitant price was asked. He told him to arrange gold coins on the land and if he could cover every inch of the whole area with gold coins. The land could be his. The businessman engulfed the whole plot with gold coins, purchased and donated the famous Amra Vana. This giving occasion is a great ideology to have come up and any sort of giving, whether it is knowledge, or money or food, whatever one can do, must not feel shy and participate wholeheartedly. My hearty salutes to the innovators of the idea.